Malines. [Mechelen] - CHEREAU, F. & J.
Map maker : CHEREAU, F. & J.. Size : 6.5 x 10.4 inches. / 16.6 x 26.4 cm. 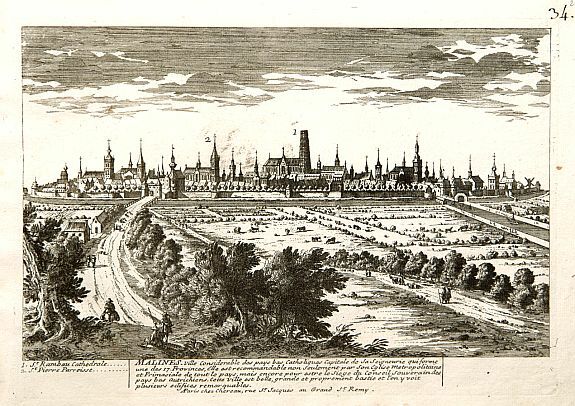 Description :A very RARE panoramic town-view of Mechelen, including a numbered legend in the left lower corner. Published by the brothers Chéreau, active in Paris at rue st.Jacques au Grand St.Remy . François Chéreau was born in 1680 in Blois, it is unknown when he settled in Paris. He was student of Gérard Audran and Pierre Drevet. In 1718 he acquired the stock of copperplates and prints of his tutor Gérard Audran. He was a very talented engraver. After his death in 1729 the copperplates were sold by his widow. His brother Jacques (le jeune) (1688-1776) was also engravers and publisher and worked for one year in England. He was well known as engraver of portraits. Very rare print with a high standard of engraving. Collector's item. Inventaire du fonds Français, vol.4p.317-341. Condition : Very good condition and impression.